pretty.pretty.paper: new favorite sea creature. 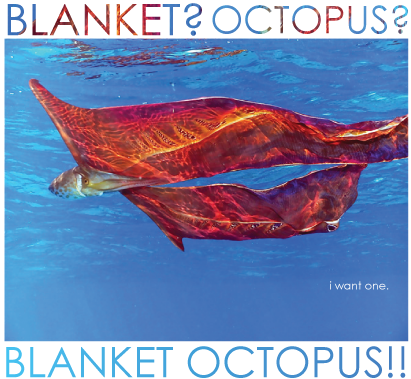 but don't you want an blanket octopus now? isn't it one of the most amazing things you have ever seen? if you've not seen oceans, i would recommend it* if only for the floating silk cloth that magically turns into a real life octopus. *i'm actually a bit disappointed with the educational value of oceans. i've yet to learn anything other than the name of the creature i'm now obsessed with. it's a quiet and more poetic take on a documentary, which is fine, but not what i was really hoping for. I really loved that film. I found the imagery SO fantastically inspiring. It was otherworldly and beautiful.